Sheikh Saleh Bin Humaid, Imam and Khateeb of the Holy Mosque, in his Friday sermon, spoke on fasting during the holy month of Ramadan and the virtues of thankfulness and patience. He urged every Muslim to pray to Allah to enable him to fast during the holy month of Ramadan, attend the congregational prayers regularly and supplicate to Allah and thank Him. Every Muslim must contemplate on the fact that Allah has extended their life-spans and granted them this great chance to fast during Ramadan. He stressed that it is an opportunity for the sinners to repent sincerely to Allah and give up their sinful habits. It is a chance to abide by the teachings of Allah s religion and perform the religious duties. He said fasting in the holy month of Ramadan leads to forgiveness for the previous sins.Sheikh Bin Humaid said being thankful is a great act of worship. He said thankfulness is half of belief (Iman) and the other half is patience (sabr) and Ramadan is the month of thankfulness and patience.He said one forgets to thank Allah if he assigns to himself the blessings and bounties that Allah has bestowed on him. When a person keeps on looking at what other people have, forgets to count his blessings and looks down on what he has, this weakens the act of being thankful to Allah. A person must not look at and covet for what Allah has granted others. He should be preoccupied with blessings and bounties that Allah has granted him.Meanwhile, Sheikh Ali Abdul Rahman Al-Hudhaifi, Imam and Khateeb of the Prophet s Mosque in Madina said the acts of worship purify and enlighten the hearts and correct people s conduct. In his Friday sermon he said Allah chose certain times during which the rewards and blessings for acts of worship are increased multifold. He said if Allah had not clarified the acts of worship and how we should worship Him, we wouldn t have known that at all. Sheikh Al-Hudhaifi said fasting is an act of worship that has a high status and it leads to in the worshipper being God-conscious and God-fearing. Allah selected the best of the months for this act of worship. 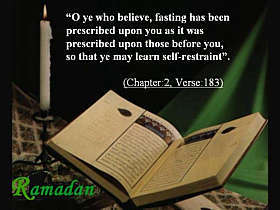 He combined in the month of Ramadan many virtues, blessings and bounties that He did not allocate for other months. He selected the month of Ramadan to command fasting in it, which is an exclusive act of worship between the servant and his Lord, and it is a sacrifice for the sake of the Almighty Allah and that there is a great reward for fasting during Ramadan.